Solon Page III, Kell, OLB 6’3″ 207 lbs. The Kell Longhorns hosted the Rome Wolves to open up Region 7 – 5A ball Friday September 9, 2016. The Longhorns pulled out a thrilling 33-30 victory led in part by Linebacker Solon Page III. Page was credited with 17 tackles and a strip as the longhorns held the Wolves to 200 yards of offense. 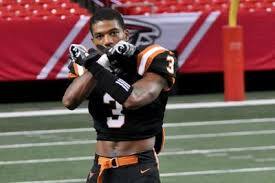 For this outstanding performance the Touchdown Club of Atlanta honors Solon Page III as our Back of the Week.